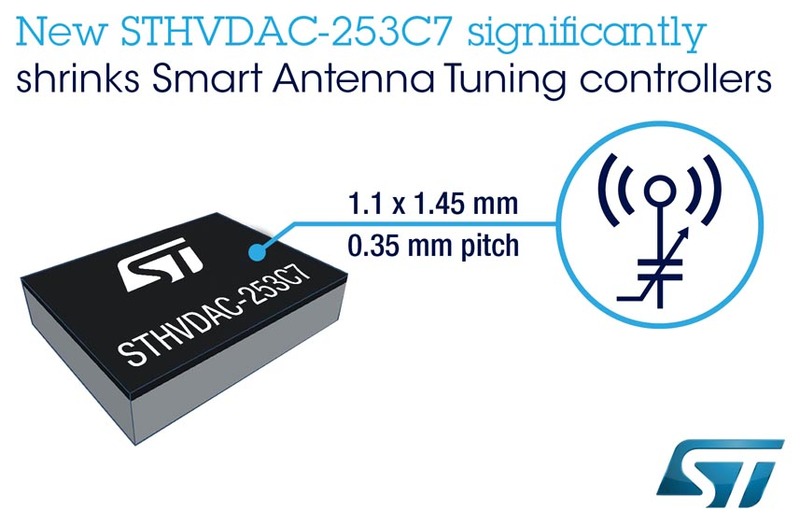 STMicroelectronics’ STHVDAC-253C7 digital controller for tunable capacitors such as ST’s STPTIC family shrinks the size, bill of materials (BoM), and power consumption of antenna-tuning circuits for stabilizing smartphone RF performance. Using the STHVDAC-253C7 with STPTIC capacitors for impedance matching and frequency tuning almost completely eliminates the effects of environmental variations, resulting in stronger signal reception, fewer dropped calls, faster data rates, and longer battery life for handset users. Leveraging ST’s advanced 0.18 µm BCD8 process and 0.35 mm-pitch flip-chip package, the STHVDAC-253C7 is 50% smaller than its predecessor and consumes half the operating current. 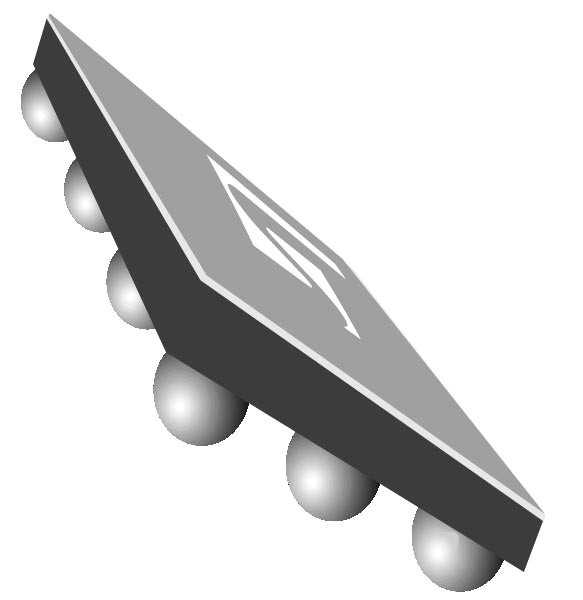 In addition, the new controller works with the latest 0402 chip-size inductors and requires no external Schottky diode, thereby reducing the overall circuit footprint even further. As a high-voltage digital-to-analog converter (DAC) specifically designed to generate bias voltages for tunable capacitors, the STHVDAC-253C7 provides three outputs suitable for tuning three different capacitances in multi-band GSM/WCDMA/LTE handsets. ST has also integrated the boost converter needed to generate bias voltages across the full capacitor-tuning range from 0 V to 24 V. The STHVDAC-253C7 accepts standard MIPI RFFE (RF Front-End) commands from the system transceiver. Support for three RFFE Unique Slave IDs (USID) allows a single STHVDAC-253C7 to manage up to three separate antennas. The STHVDAC-253C7 supports commonly used antenna-tuning modes, including Normal mode, which moves to a newly commanded output voltage within 10 µs; Turbo mode, optimized for minimum settling time; and Glide mode, with programmable delay from 512 µs to 16.84 ms for the smoothest transitions and to meet requirements such as 3GPP phase discontinuity. A GPIO pin is provided that can be used for managing two controllers on the same RFFE bus in dual-tuner handsets. It also allows switching between registers to manage antenna-diversity designs or adjust settings to correct the antenna response when a USB cable is plugged in. Production of the STHVDAC-253C7 is ramping up, in 12-bump 0.35 mm-pitch WLCSP flip-chip. Pricing options start from $0.19 for orders of 1000 pieces, and samples are available immediately to support design and development.